UC Industries’ patented process technology makes it possible. The process gives Foamular a tight, closed cell structure and continuous skin surface, front and back, that’s highly resistant to moisture of all kinds – water leakage, condensation, ground water, wet soil, freeze/thaw cycling, etc. YEAR AFTER YEAR, FOAMULAR RETAINS ITS HIGH R-VALUE – Because of Foamular 250’s inherent moisture resistance properties, its R-value of 5 per inch of thickness won’t diminish over time, as other insulations do. 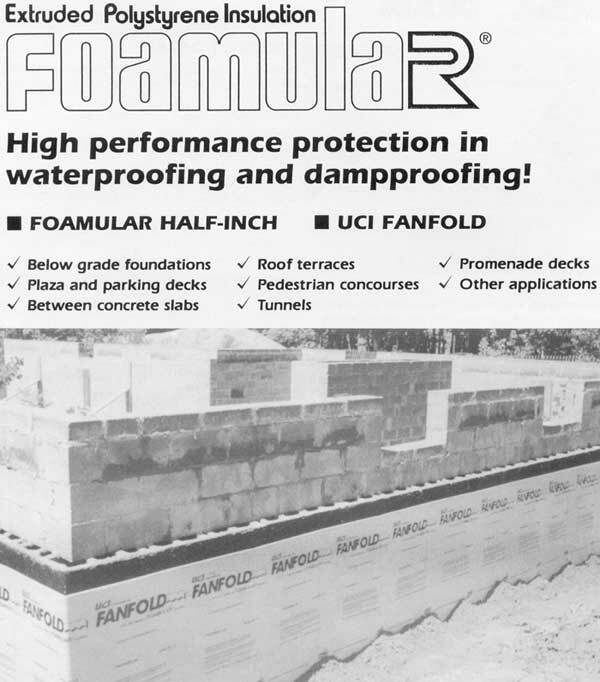 Year after year, Foamular keeps on insulating – and saving – even after prolonged exposure to moisture. HANDLES AND INSTALLS WITH EASE – Foamular 250 (25 psi) is a rigid foam extruded polystyrene insulation that’s tough and durable, yet lightweight. This facilitates both handling and installation, and permits easy sawing, cutting and scoring with a sharp knife. Foamular 250 offers higher compressive strength and energy efficiency in flat deck singleply roofing systems both for new roofs and reproofing applications. Lightweight rigid foam panels make the product easy to hoist, handle and install and add little to the overall roof weight. Provides solid backup for roofing membrane. 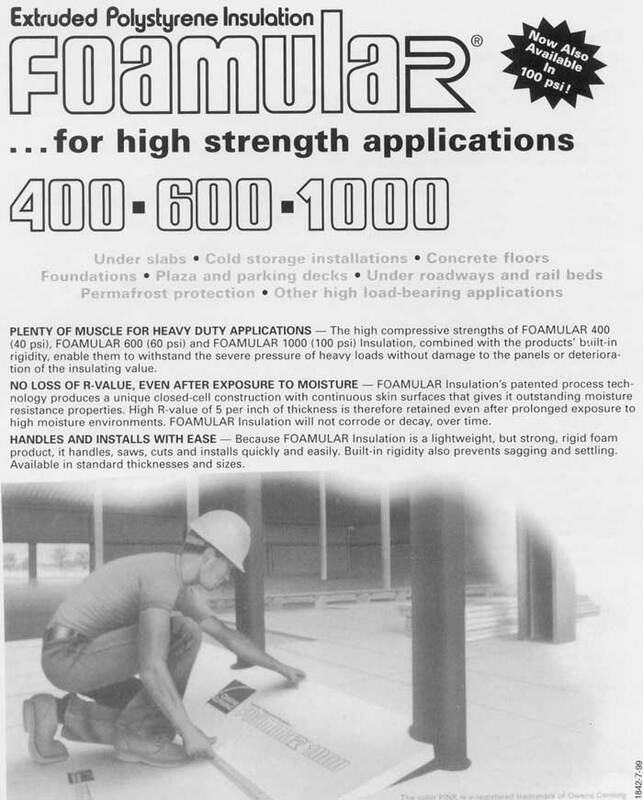 Foamular 250 is also available for use in tapered roofing systems that help prevent problems caused by excessive ponding and ice buildup. Installed between wall ties. Foamular 250 saves energy by retarding heat transmission. Since the product is highly resistant to moisture, it will not lose its R-value of 5 per inch of thickness over the years. In addition, Foamular’s built-in rigidity means it never settles like poured or blown types of insulation. When used with masonry or concrete back-up walls, Foamular 250 installs against the wall by means of any quality metal wall furring system to provide excellent thermal resistance. Strips also serve as positive attachment for gypsum panels, directly to the wall. Readily applied to the exterior of concrete foundations or concrete block, Foamular 250 may be adhesively attached or held in place with either mechanical fasteners or backfill. In areas between ground level and the bottom of exterior wall, the exposed surface of Foamular 250 is covered with reinforced stucco, painted weatherproof board or other approved protection. 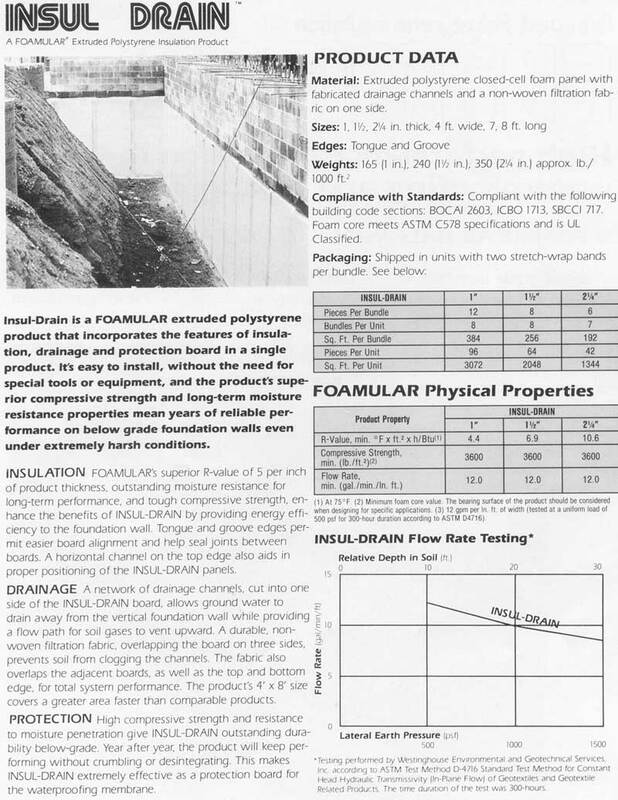 In crawl spaces, Foamular 250 is covered with gypsum panels or otherwise protected where required by building codes. For applications where the insulation is used beneath the slab. Foamular 250 can often be the highly economical choice. It handles easily to save labor costs and offers a compressive strength of 25 psi – sufficient for many under slab requirements. Where greater compressive strength is needed, higher density Foamular insulation products are available. 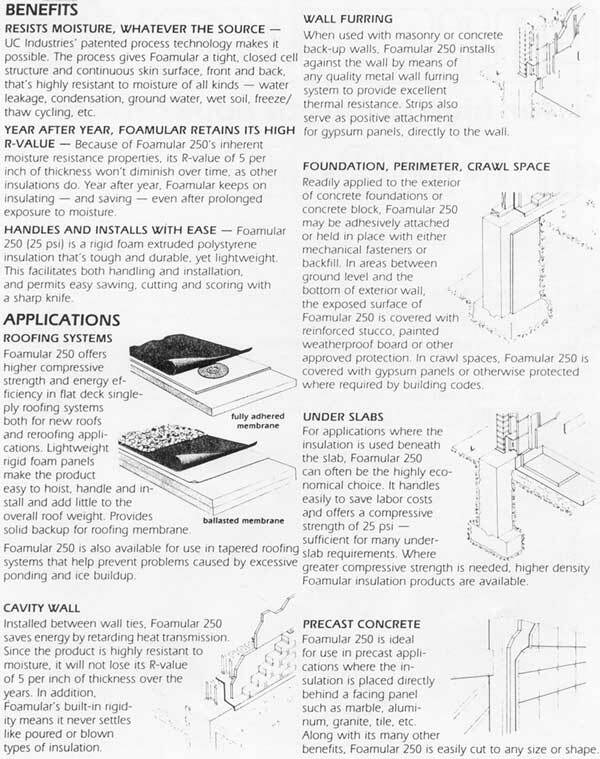 Foamular 250 is ideal for use in precast applications where the insulation is placed directly behind a facing panel such as marble, aluminum, granite, tile, etc. Along with its many other benefits. Foamular 250 is easily cut to any size or shape. * Other high load-bearing applications. PLENTY OF MUSCLE FOR HEAVY DUTY APPLICATIONS - The high compressive strengths of FOAMULAR 400 (40 psi), FOAMULAR 600 (60 psi) and FOAMULAR 1000 (100PSI) Insulation, combined with the products built-in rigidity, enable them to withstand the severe pressure of heavy loads without damage to the panels or deterioration of the insulating value. NO LOSS OF R-VALUE, EVEN AFTER EXPOSURE TO MOISTURE – FOAMULAR Insulation’s patented process technology produces a unique closed-cell construction with continuous skin surfaces that gives it outstanding moisture resistance properties. High R-value of 5 per inch of thickness is therefore retained even after prolonged exposure to high moisture environments. FOAMULAR Insulation will not corrode or decay, overtime. HANDLES AND INSTALLS WITH EASE –Because FOAMULAR Insulation is a lightweight, but strong, rigid foam product, it handles, saws, cuts and installs quickly and easily. Built-in rigidity also prevents sagging and settling. Available in standard thicknesses and sizes. · Permitting construction to get into “the dry” quickly allowing the brickwork to follow at a conveniently scheduled time. · Providing the desirable aesthetics and attributes of a brick masonry building. · Reduced structural weight resulting in material and labor cost savings. · Thermal inefficiency; is steel framing a tremendous energy short circuit? · Moisture tolerance; is the system vulnerable to moisture damage? · Deflection criteria; are steel studs sufficiently stiff to prevent flexural cracking in theveneer? · Attachments; are commercial brick ties adequate to transfer lateral loads? · Hohmann & Barnard DW-10-X (or equal) anchoring systems; to effectively tie masonry to the steel framing through the foam sheathing. 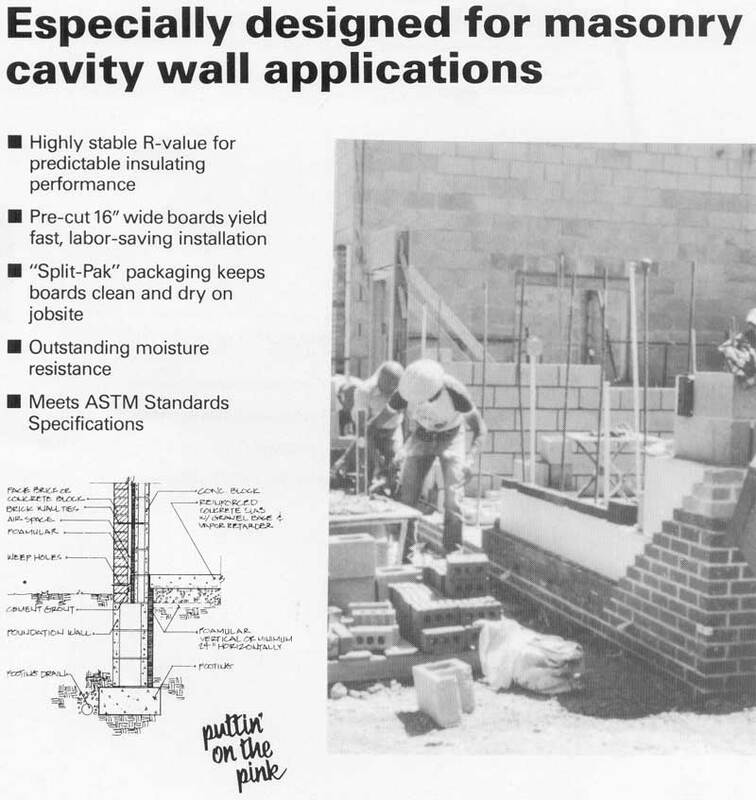 · Brick Institute of America (BIA) design standards; to specify defection criteria for the steel stud system. 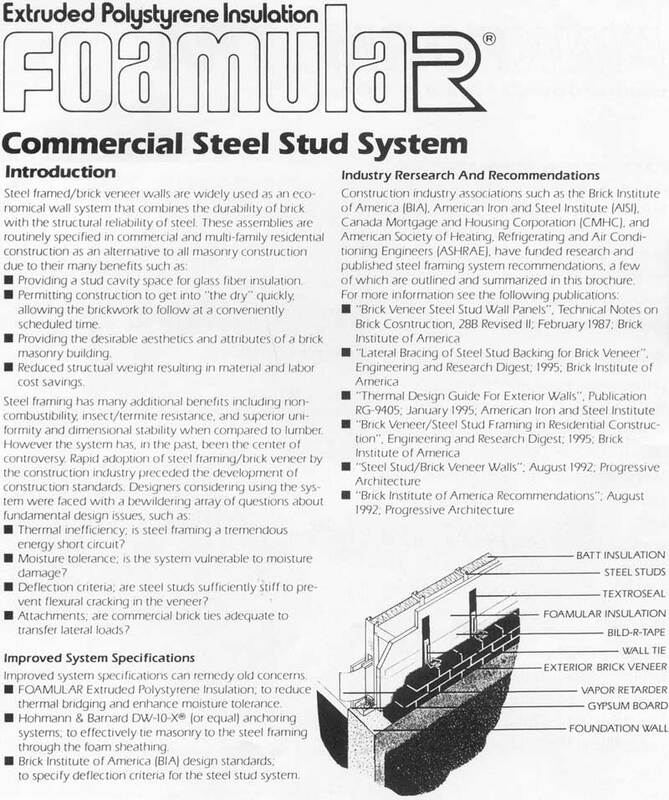 Construction industry associations such as the Brick Institute of America (BIA) America Iron and Steel Institute (AISI), Canada Mortgage and Housing Corporation (CMHC) and American Society of Heating, Refrigerating and Air Conditioning Engineers (ASHRAE) have funded research and published steel framing system recommendations, a few of which are outlined and summarized in this brochure. The method of using rigid foam as concrete forms in constructing residential walls, in both below and above grade applications, is rapidly finding high acceptance for the added value it provides as a solution to the shortcomings of traditional home construction. It’s a solution that’s created a huge number of fans among builders and consumers, alike. 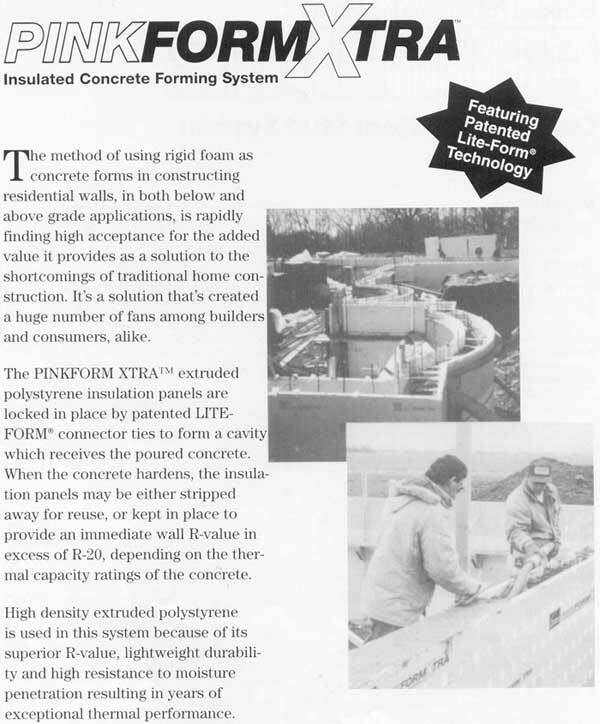 The PIINKFORM XTRA extruded polystyrene insulation panels are locked in place by patented LITE-FOAM connector ties to form a cavity which receives the poured concrete. When the concrete hardens the insulation panels may be either stripped away for reuse, or kept in place to provide an immediate wall R-value in excess of R-20, depending on the thermal capacity ratings of the concrete. Lightweight durability and high resistance to moisture penetration resulting in years of exceptional thermal performance. Extruded polystyrene closed-cell foam panel with fabricated drainage channels and a non-woven filtration fabric on one side. 165 (1 in.) 240 (1-12 in.) 350 (2-14 inc.) approx. lb./1000 ft.
Compliant with the following building code sections: BOCA1 2603, ICBO 1713, SBCCI 717. Foam core meets ASTM C578 specifications and is UL Classified. Packaging: Click image to view Packaging information. Description: HIGH PERFORMANCE PROTECTION IN WATERPROOFING AND DAMPPROOFING! Description: Click image to view chart.